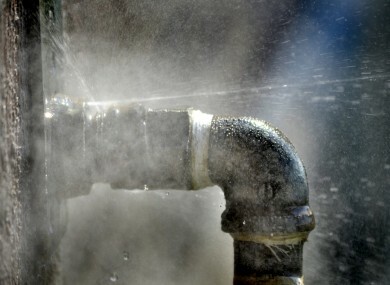 Councils in five areas still expect to lose most of their treated water to leaks by the end of the year. IRISH WATER PLANS to reduce pressure in localised areas as part of a its effort to fix leaks and improve the country’s water system. The semi-state company’s head of assets, Gerry Grant, gave details this morning on how engineers intend to proceed. He was speaking to Morning Ireland, after information released to RTÉ showed local authorities are losing 40 per cent of their supply through leaks. Five councils still expect to lose most of their treated water to leaks by the end of the year, according to service plans the authorities have with Irish Water, according to RTÉ. Grant said they hoped to improve leakage rates by two per cent by the start of 2016. The roll-out of the metering process means the company is now building up a more accurate picture of how much water is being lost, he said — adding that the drive to address the problem is going to be a “slow, systematic” and “painstaking” process. The existing network has been developed on an ad-hoc basis, Grant said — “largely based on gravity systems, and largely based on having pressure to serve the houses at the highest point of the system”. What that means is that you have areas of the system that are operating under excessive pressure and they’re leaking far more. If you happen to live on a hill and have a tap with gushing water, then it’s likely any leaks in your pipes will be worse too, Grant explained. Pressure in Cork, he said, was too high in much of the network. There’s a similar problem in the centre of Dublin city. As a way of addressing the amount of water being lost through leaks, engineers plan to reduce pressure for certain areas. Improvements in technology mean this can be done in a much more “broken down” way, he said — stressing that customers would not see their supply cut off or reduced to a trickle as a result. The pressure of the tap will be sufficient in all cases. Engineers will also be finding and fixing leaks as they attempt to improve an old system with “thousands of leaks all over the place” said Grant. Email “Irish Water will be reducing pressure as part of its "painstaking" effort to fix leaks”. Feedback on “Irish Water will be reducing pressure as part of its "painstaking" effort to fix leaks”.